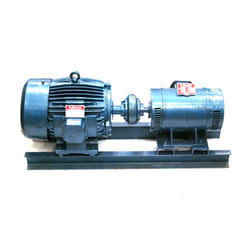 We are manufacurers of High quality Load Bearing DC, AC Motors and Generators. These are warrantied for a long period to deliver superior performance. These are accompanied with Electric Control Panels to run and control the same. - Outer yoke made up of High grade cast iron MS frame. - High grade silicon stamping Stator with hydraulically pressed. 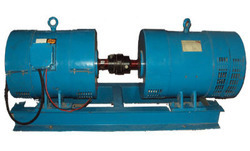 - Suitable copper conductor of best quality used for winding for both Stator and Rotor. - Skewed Rotor construction with dynamically balance ensuring low noise. Squirrel Cage Induction Motor with star delta starter and directlycoupled to DC shunt generator and switch board mounted with regulator, air breaker, ammeter, voltmeter, knife blade switches and fuses, set complete with case iron and plate, fixing bolts, foundation bolts and flexible coupling.